To honour the opening of one of the world’s greatest Tennis Grand Slam Tournaments, I’m dedicating this afternoon’s post to Wimbledon! Tickets for The Championships are notoriously tricky to come by coupled with the fact that we’re more likely to see Murray win in straight sets than make it there in time to nab a decent spot on Henman Hill. So let’s bring the atmosphere of Wimbledon to us with a few fragrances to get you in the mood for your centre court appearance! This elegant bottle from Paris fashion house Hermès is the 4th fragrance from their garden-inspired series. Literally translating to “A garden on the roof”, it pays homage to the roof-garden situated atop the Hermès’ HQ building in Paris! One of the more instantly familiar notes within the jus is the freshly cut green grass synonymous with Wimbledon as one of the few remaining great grass courts! Pre-match nerves abound and the air crackles with tension as tight as strings on rackets! If you could only snoop backstage to taste the atmosphere you’d get more than a hint of the cool, fresh notes waiting within this offering by Lacoste. Simply titled ‘Blanc’ it evokes the spirit of the iconic L.12.12 polo shirt which translated to girl-speak means that lush, clean… crisp scent you’d get from nuzzling your nose in Federer’s freshly-ironed match-whites with just a hint of the iconic champion left behind. It wouldn’t be Wimbledon with the event’s signature snack of strawberries and cream! Like the sun with no moon, sausages sans mash… it just wouldn’t be the same without it. Dior’s Miss Dior Chérie has some serious strawberry credentials that strike like a punnet of Kent’s finest with a backhand of caramelized sugar. If anything can help remind the on-court grunters that they are indeed laydees, this would be the flirty scent for the job. It’s unashamedly girly, fruity and pink! I don’t need to tell you what this one reminds me of? Clue: it’s not Cliff Richard. La Prairie Midnight Rain is another fruity floral but with some serious “ooh la la” leanings. While Miss Dior Cherie will render you the juiciest filly in the stand, Midnight Rain will have you tearing up the turf at the after party! Opening with some tropical top notes the fragrance dries down to a sensuous musky finish, it’s not a sexydirty scent but it’s not alltogether innocent either. One thing’s for sure… it wouldn’t let rain stop play! 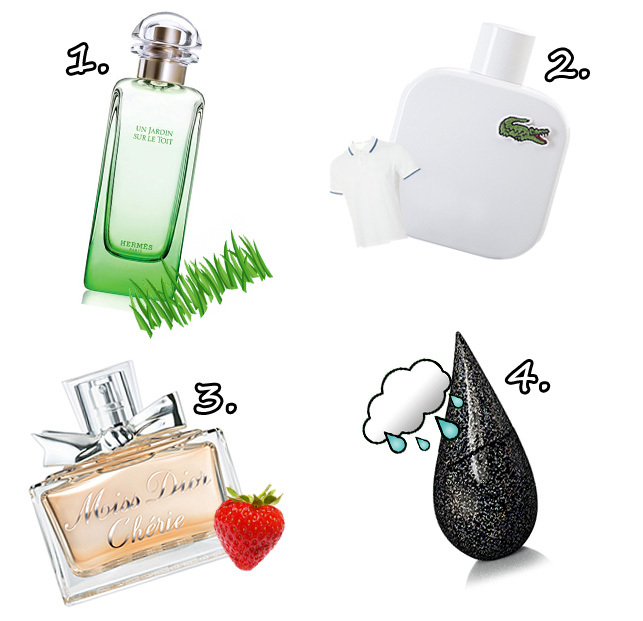 Who’s gonna win the men’s final this year and what fragrance are you wearing today? I was thinking: “Oh, they’ve changed the packaging of the La Prairie,” but I was thinking of SILVER Rain. La Prairie is just so expensive. Liking the sound of Midnight Rain, not, however, liking the price tag – that is brutal! Miss Dior Cherie has been my go-to for the past couple of years. I think I’ll go on wearing till I finally realize it’s not age-appropriate anymore!